Garni Temple in the remote countryside of Armenia. Armenia is blessed and bunged with more temples, churches and monasteries than you can count. 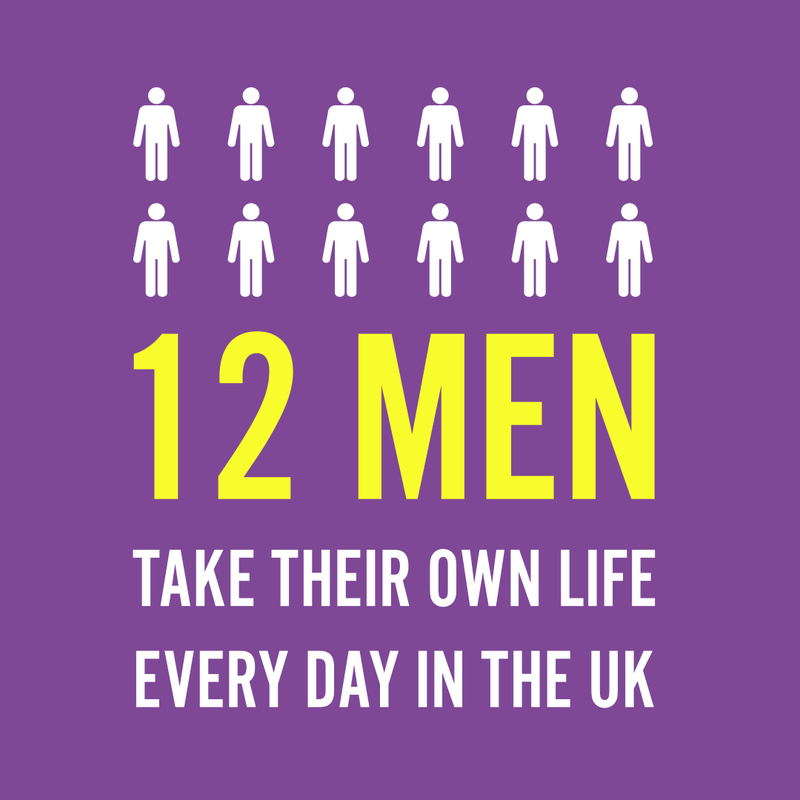 So while in the country you will want to tick a load of them off. 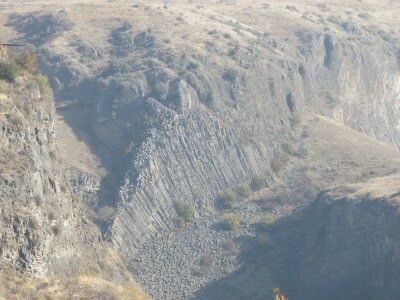 Garni is an unusual one, so you should get it on your list. 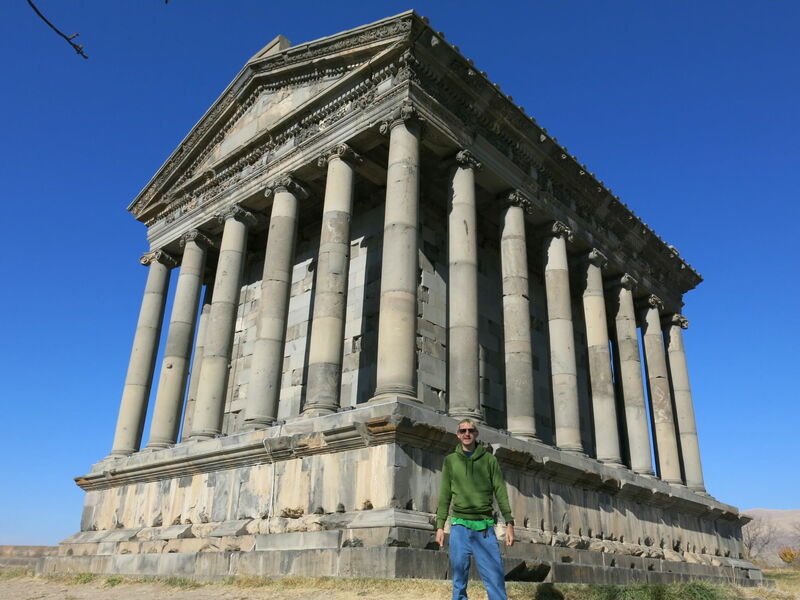 Not your bog standard Armenian Monastery, Garni is a Greek temple situated in mountainous countryside. It’s also a UNESCO listed World Heritage Site. 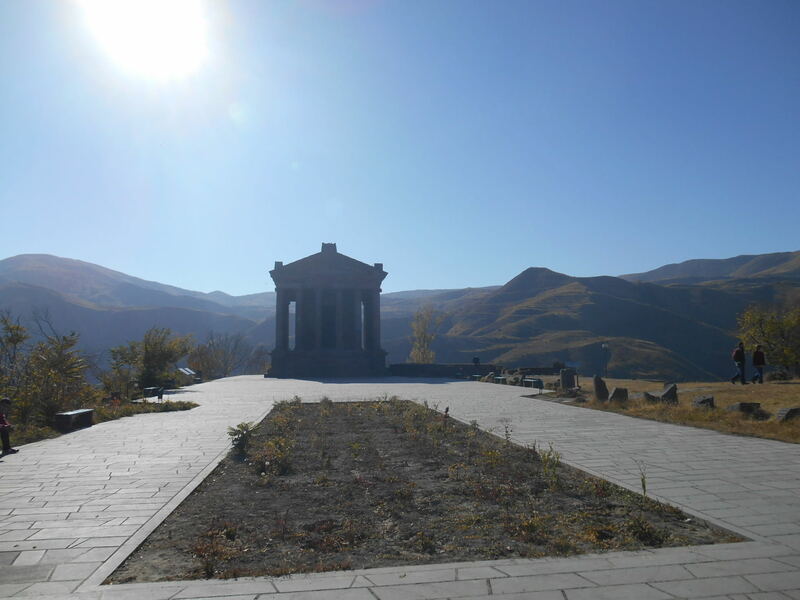 At the end of this path, against a spectacular backdrop is Garni Temple, Armenia. 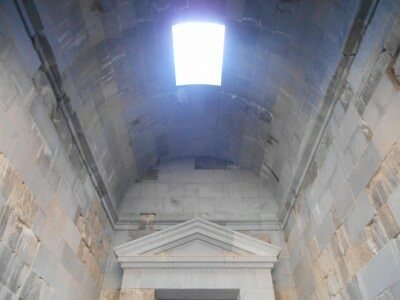 You can of course stay in Garni itself (a small village) but most travellers base themselves in Yerevan and do Garni as a day trip (often tied in with a visit to Geghard Monastery as well). For the basis of this article and the fact I myself was based in Yerevan, let me tell you how to get there from Armenia’s capital city. 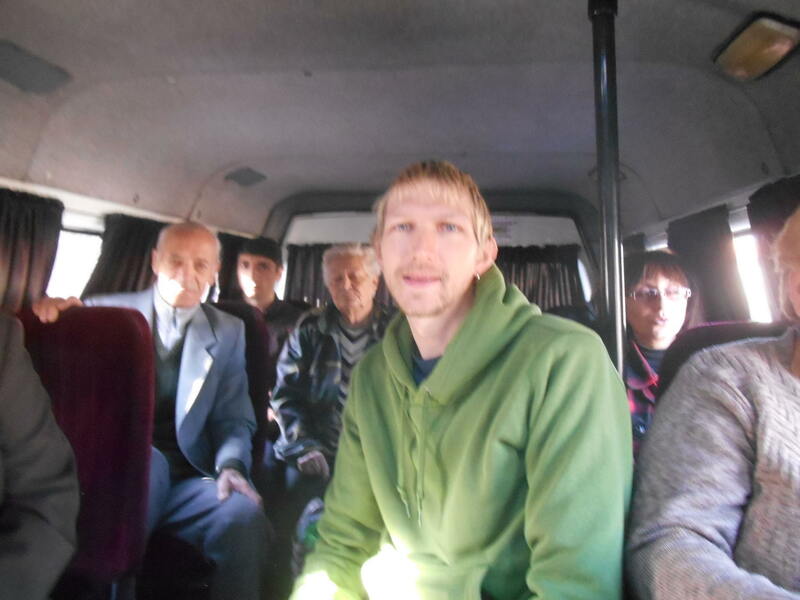 On board the number 22 bus to Garni. First of all head to Abovyan Street near the corner with Koryun Street and check the bus stops there. 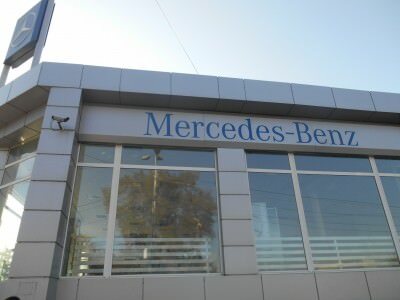 You’re looking for a bus number 22 that heads out of the town (north east) to GAI Poghots where you will see a Mercedes Benz dealership. The number 22 is not the only bus that goes here by the way – but we were based at the awesome Penthouse Hostel and this bus stop was only round the corner. I believe the number 51 will also take you there. 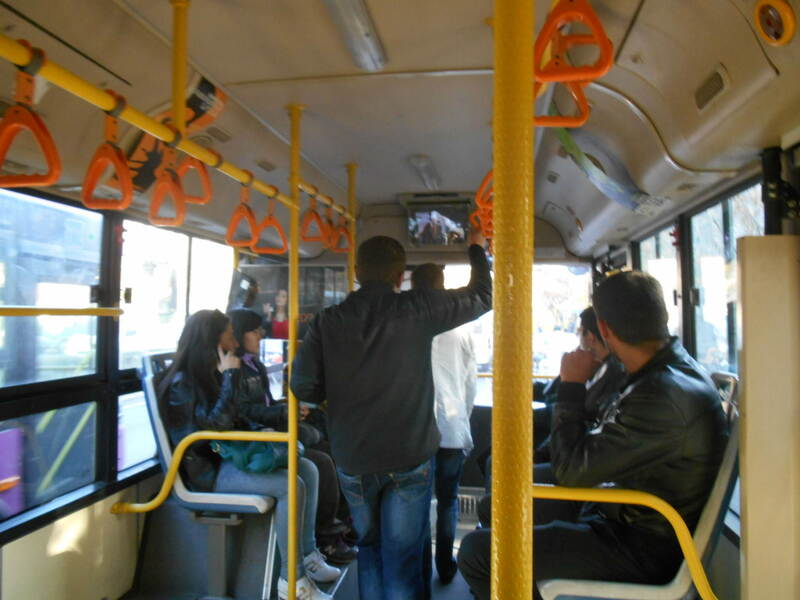 Ask around, and don’t forget the bus routes in Yerevan often change. Your aim is to get to the Mercedes Benz dealership on GAI Poghots Street. This bus should cost 100 Dram (pay with a single coin – change is hard to come by on Yerevan buses). Get yourself out to GAI Poghots and the Mercedes Showroom. From GAI Poghots, on the opposite side of the side road by the Mercedes Benz dealership, there is a small bus station for mini-buses and marshrutkys. Here there is a second bus you need to get out to Garni. 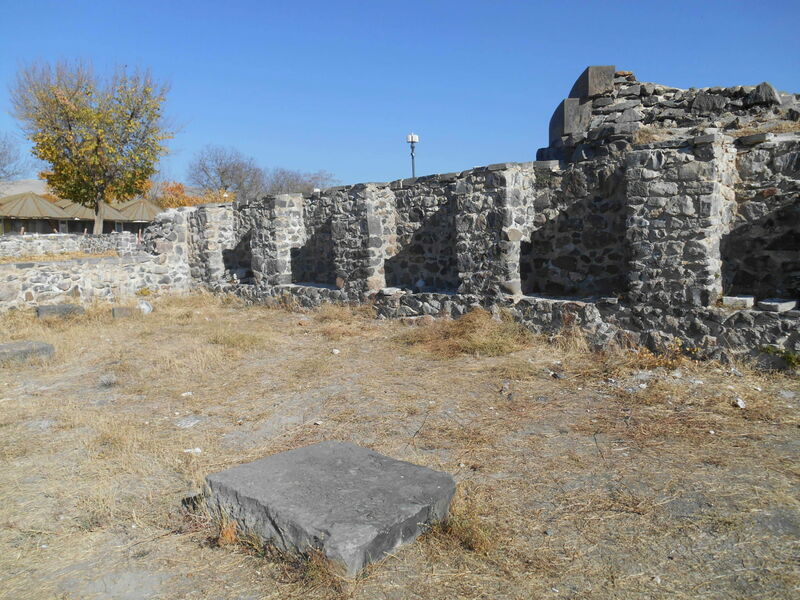 Ours was number 266 and it stopped at Garni (last stop). There may be other bus numbers you can get from there. Ask around. Our bus was 500 Dram per person. It was a nice journey up through hills and countryside and took around 30 minutes. On the Marshrutky out to Garni. 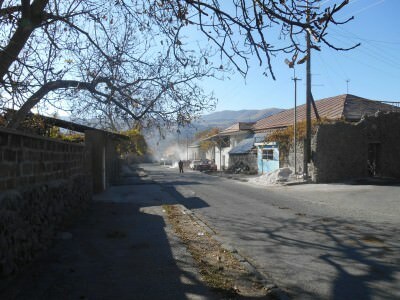 You’ll arrive in Garni Village. It’s a small village that has a slight tourist trade due to the Temple. You walk to the bottom of a street and there is the Temple entrance. 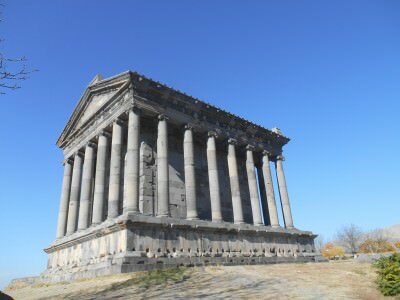 Garni Village – not a great deal happening except for the temple. You’ll need to pay an entry fee of 1,000 Dram to get inside. They will say that this is for a museum, but it’s actually just entry to the site itself. You get issued with a ticket. 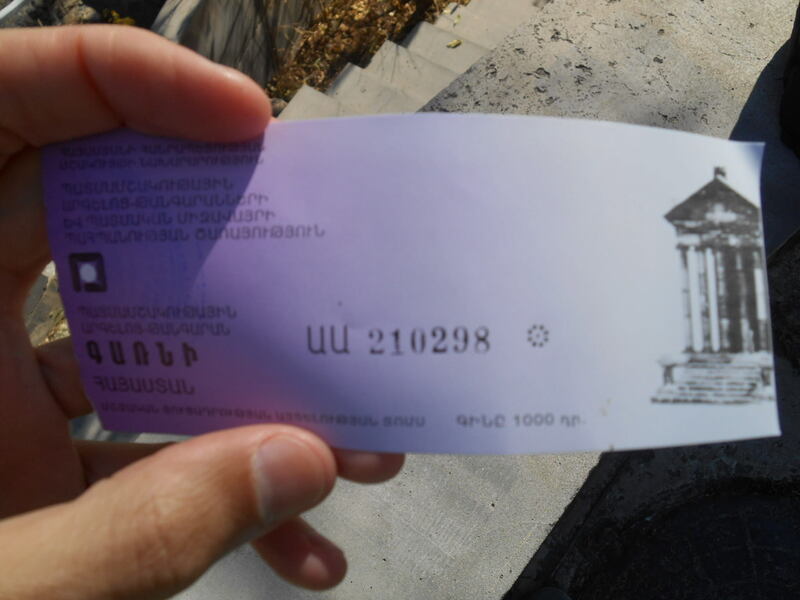 The ticket for Garni Temple costs 1,000 Dram. The guy at the gate on the way in was eating a cheese sandwich. He gave me one which was immense! This was the first time I had tried real cheese in years!! (probably since I lived in Australia). 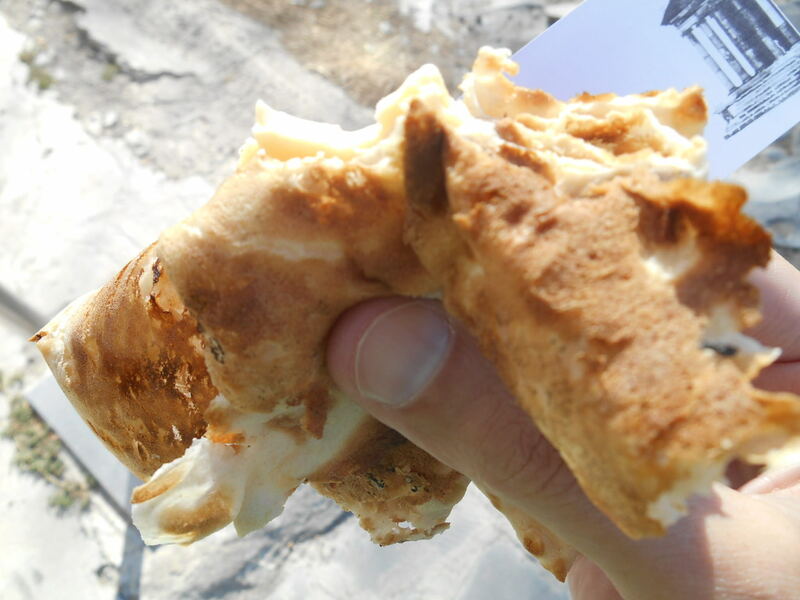 Free cheese and bread on the way into Garni was my random bonus! 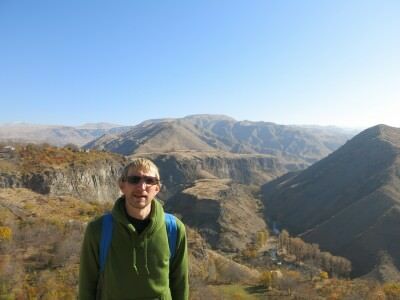 The canyon in behind me and great views from Garni. You can hike up to these rocks, which are hexagonal and known as the “symphony of stones”, not dissimilar to the Giants Causeway rocks in Northern Ireland, without the crashing waves of course! The symphony of stones at Garni. Walk around, admire it and wonder how on earth it’s still here. This was apparently built in the FIRST Century. Garni’s exterior and the fact it dates back to the first century…amazing! Step inside and marvel at how small it is. If you’re feeling religious say a prayer or sing a song. 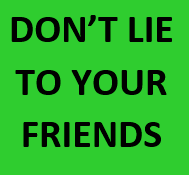 Many people do. Admire the interior of Garni Temple in Armenia. There is a lot of debris and ruins in the church grounds so you can marvel at the size the entire site would have been. The church grounds beside Garni Temple. 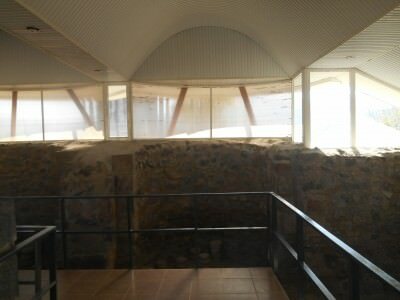 There’s now a cover on the top and it’s enclosed but you can see the remains of what was once a Bath House. 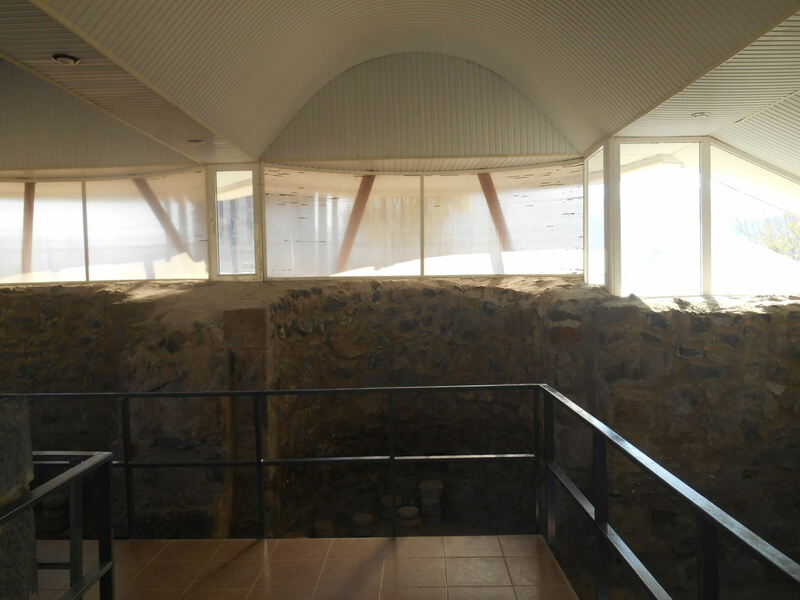 Inside the remains of the Bath House. 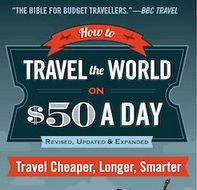 Not just me, but other travellers are extremely guilty of visiting places, walking round, taking photos but not reading or researching about the places they go. 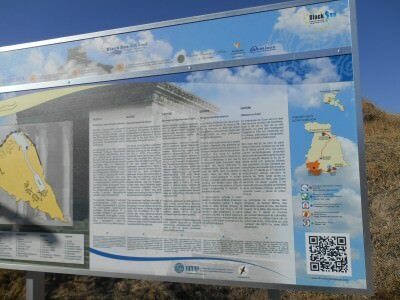 I took some time out at Garni to read the information boards. This place was dedicated to Mitra the God of the Sun. There used to be 14 towers here. The bathhouse used to have a mosaic with the God of the Ocean on it. These are the things to read up on. Check out the information boards at Garni Temple in Armenia. After you’re done with Garni, it would be silly not to also visit Geghard Monastery which can be reached by heading to Goght next. We took a Marsjrutky there, then shared a taxi. Hitch hiking and walking are other options, and I’ll try and get a write up on Geghard too. Of the two places, Garni was my favourite however. It’s just that bit different from the ancient sites you visit in Armenia. Such as Haghpat, Tatev, Sanahin and Gandzasar (which is actually in Nagorno Karabakh). This entry was posted in Armenia, Armenian Monasteries, Central Asia/Middle East, Destinations, Garni. Bookmark the permalink. Amazing! 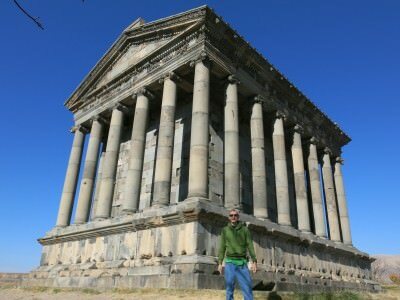 You see some fantastic sites Jonny, I would expect this kind of building to be in one of the Mediterranean countries like Greece, not Armenia! Thanks! Just used these buses today and worked line a charm.